Want to make sure that you get into an amazing SUV? The Ford Expedition is rated number one in the large SUV market by US News & World Report. The Ford SUV has received the highest marks for performance, reliability, and interior features. Most drivers have noticed the upgrades to the technology system, but you’ll get the most from the premium SYNC 3 package. The base edition includes a lot of features for convenience, such as push-button start, 4.2-inch display, six-speaker stereo, and connectivity features. If you want to upgrade, you’ll get more convenience and connectivity with your very own Wi-Fi hotspot and instant connection through Android Auto and Apple CarPlay. There are also four USB ports included with the latest Expedition. If you do upgrade, you’ll also get an 8-inch touch screen display with lots of other bells and whistles. 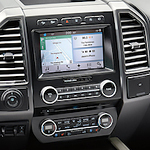 You can test drive the new SUV and see all of the technology inside for yourself when you stop by West Herr Ford of Rochester.